Order Our New 8GB Thumb Drive with Three Special Messages. When you begin any venture, you want to know “What’s in it for me”? This message will give you plenty of motivation. Learn about these powerful benefits that are as realistic as they are life-changing; some of these benefits may surprise you; some you won’t want to miss. Want to work close to family and home? Maybe you’re tired of the road. 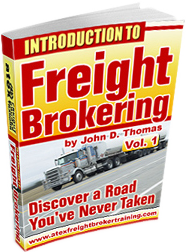 Learn how to broker freight right from your kitchen table, if you like. Learn who your customers are; what specialized knowledge you need; how you will work with, and find, your customers and carriers; even how much to charge for each load – plus more – all from the perspective of working from home. Some aspects of starting a brokerage are simple; some are not. Learn which is which and then take action and get on the road to brokering. Learn what a freight broker is and is not; how to get started; what about freight broker training; what to expect from customers and carriers and what THEY will expect from you; some of the benefits you can find as you work in these multi-billion dollar industries – plus more. Which is the best training option for you? Each audio is narrated by Atex associate, Christine.